It’s that time of year again – the time to buy chicks. 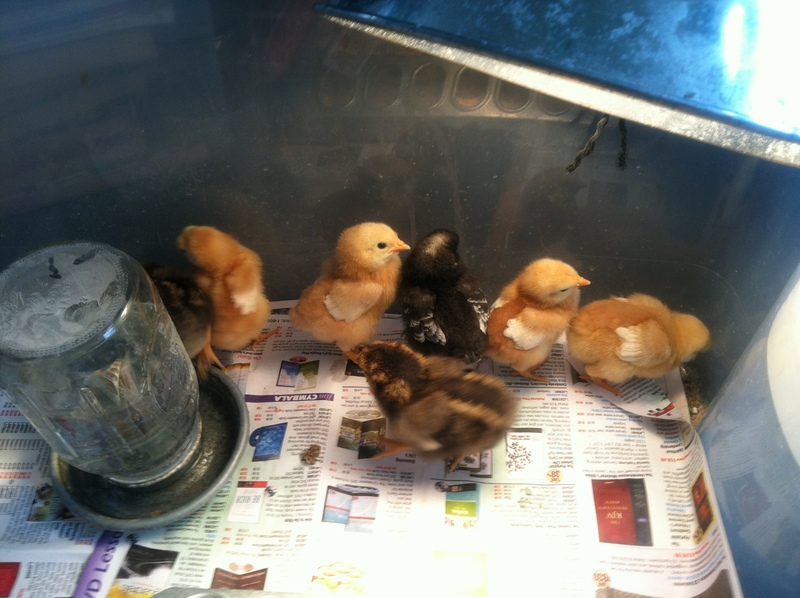 I stopped by the co-op on my way home from school Monday with the intention to buy six adorable soon-to-be-less adorable chicks. I came home with eight, so not that bad. They currently reside in my bedroom, and their incessant cheeping keeps me up at night (good practice for baby season?). We got four golden comets, two barred rocks, and two golden-laced wyandottes. I can feel the restlessness in the flock outside: who’s gonna go? who’s not gonna make the cut? We’ll deal with that when the time comes. In other news, I wore flats and didn’t feel like my feet were going to freeze off. April’s turning out pretty well so far. P.S. Friday, I’ll be having my first guest-post. I thought it was about time to have a voice other than mine on this blog; my friend Bryn will be talking about fiction and its role in our lives, so stay tuned! This entry was posted in chickens, the good things and tagged april, chickens, chicks, spring on April 2, 2014 by catherine_hawkins. Music. I discovered this band on the radio. I listen to 92.5 The River, and it always makes me think back to middle school. My best friend was cooler than me – she was more eclectic than your average kid – and she was listening to 92.5 and David Gray and other alternative bands way before any of us were. I remember teasing her because I didn’t know how great these different sounds could be. I’m always late to the party. But here’s the band. Boy and Bear. I know absolutely nothing about them except that I love their sound. Sherlock. It’s back. I can’t even tell you how excited I was to watch that first episode. I waited until it aired on PBS (I have amazing will-power, apparently. But really? I just wanted to watch it on the big tv…), and I was swept right back up in my love of Sherlock and Benedict and the friendship between Sherlock and Watson and everything. (For those of you who don’t know, I have a slight love affair with this.) Twitter and facebook were things to be avoided before I watched it – some people just can’t help spoiling things. Eggs. It’s been a long December (haha, Counting Crows, anyone?!) and beginning of January. The temperature has been in the teens and lower, and the girls can’t handle it. We weren’t getting a single egg for a few weeks. I let customers down. I didn’t know if the girls would recover. But this week it’s been a little better – we’re averaging about five eggs a day which, with nearly twenty hens, is quite terrible, still. One step at a time. Pickles. This might be strange, but I LOVE pickles. Claussens – big, whole cucumbers, cold – dipped in hummus. Homemade mustard pickles for dinner with buttery potatoes and steak. Homemade bread and butter pickles with pork chops. They’re tangy and delicious and add flavor when every other food seems so utterly boring in January. Happy Wednesday! And happy snow day to my fellow teachers! This entry was posted in chickens, film and tv, music, the good things and tagged boy and bear, chickens, eggs, movies, music, pickles, sherlock, the artist, watson on January 22, 2014 by catherine_hawkins.